I’ve been wanting to prepare a new nature tray for spring, and our nest theme is perfect for it. 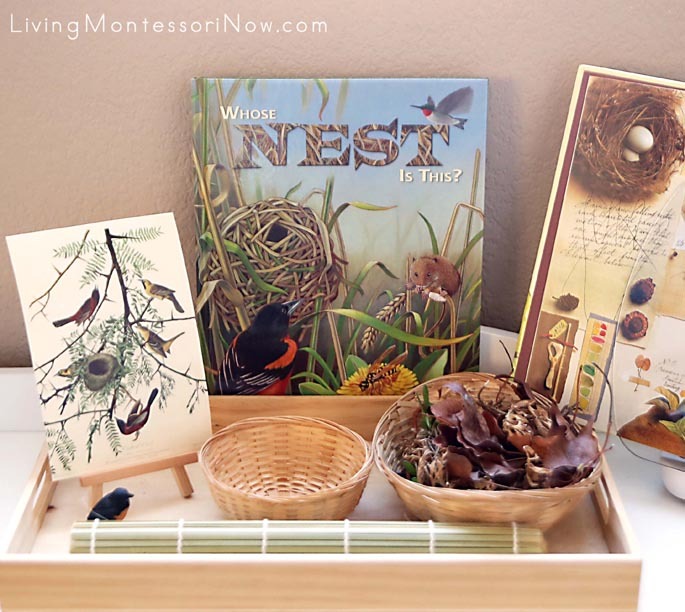 After researching STEM nest-building activities, I decided to prepare a Montessori nature tray with a simple nest-building activity that can be repeated as many times as a preschooler wishes. This would work well at home or in the classroom. 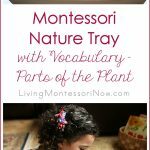 My 4-year-old granddaughter, Zoey, and I have had lots of fun with nature walks and nature trays in the past. 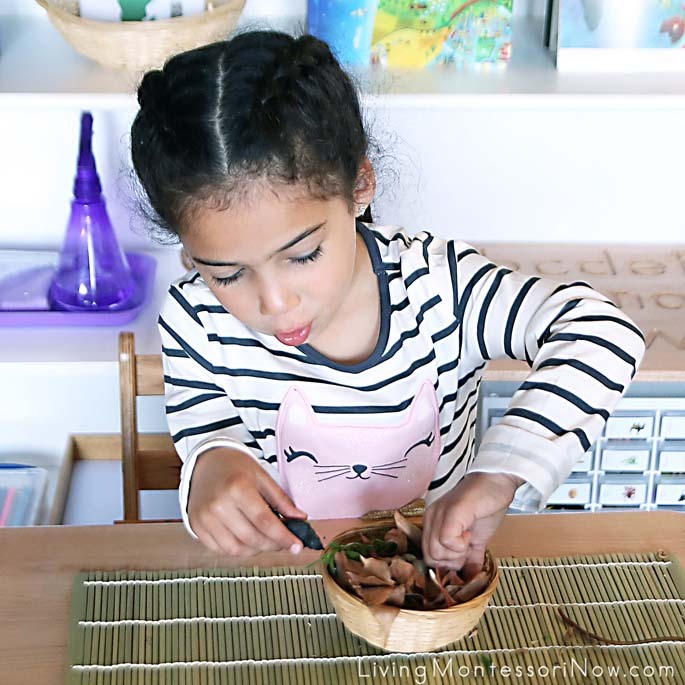 We’ve enjoyed nature activities such as our nature walks and nature cutting trays, Montessori nature tray with magnification work and flower arranging, life and death nature tray, flower arranging activities, Montessori nature tray with parts of the plant work, and tactile nature letters. 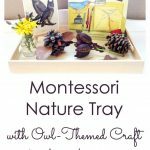 Last fall, we even had a Montessori nature tray with owl-themed craft and art appreciation. 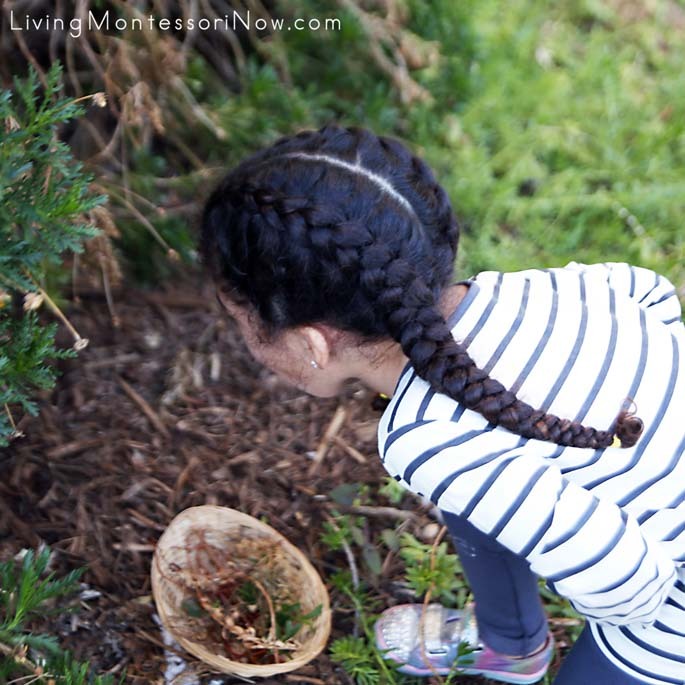 After researching various nest-building activities, my favorite for our purposes was “How to Engineer a Bird’s Nest” from Great Stems. I liked that it built a basic framework with twine and a glue mixture and then wove in and filled the framework with natural materials. The problem was that I needed a couple of days for the framework to dry. I decided that, for us, it would work best to simply use a small basket for the framework and fill that with the nest-building materials. It’s so simple, yet it can look at least somewhat like a nest. 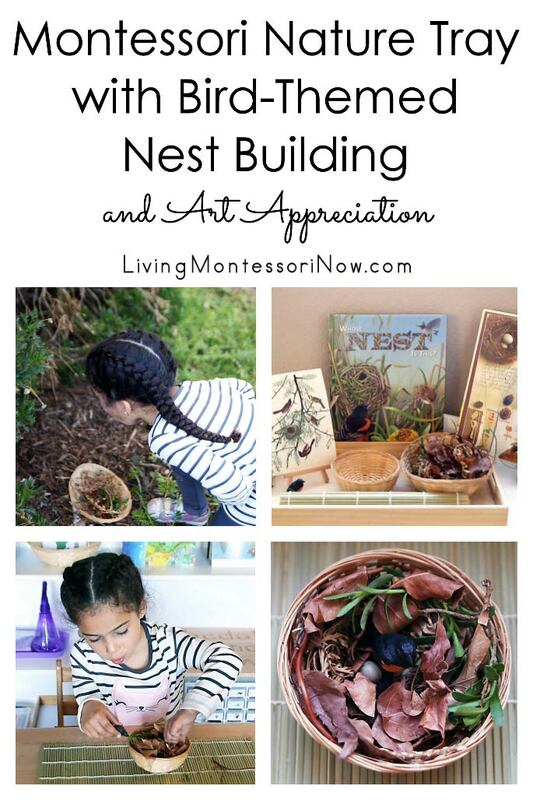 And for preschoolers, I love that the nest building isn’t frustrating and can be repeated over and over again. For children a bit older, I’d definitely recommend the glue and twine framework with nest weaving. 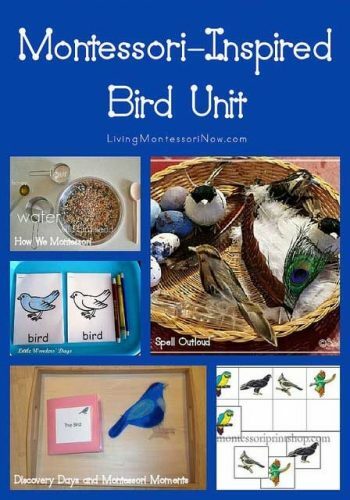 See my Bird Unit Study Pinterest Board for more ideas of STEM (Science/Technology/Engineering/Math) nest-building challenges. Zoey and I went on a nature walk in search of nest-building materials such as twigs, leaves, grass, moss, and feathers to build the nest. We didn’t find any feathers, but we found enough nest-building materials for Zoey to have fun building her nest! Zoey loved the nest building! I encouraged Zoey to start with some flexible twigs for the outer frame. Then she added the rest of the materials. It was interesting to see how difficult it would be to actually weave the materials like birds do. When Zoey had finished her nest, she wanted to add eggs and a bird. Fortunately, I had gotten an extra set of eggs for our nest and egg addition and subtraction activity. 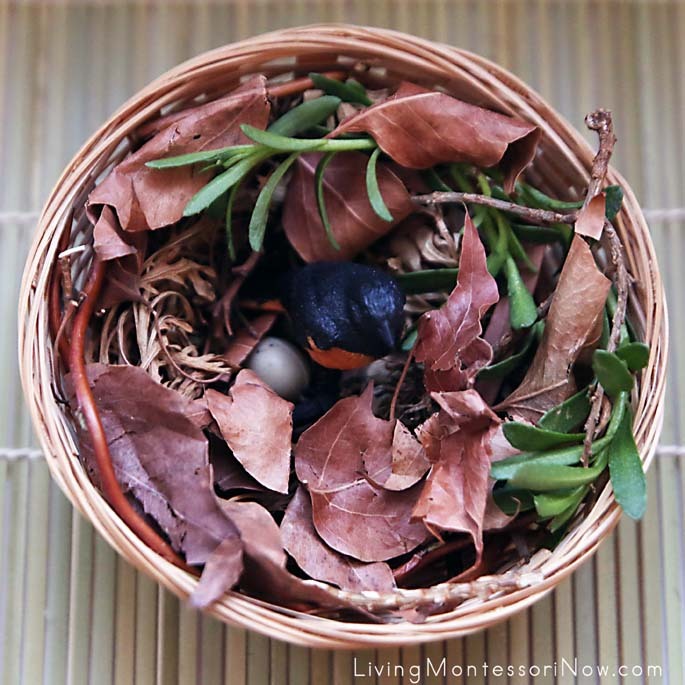 The oriole from the nature tray and the miniature plastic eggs worked perfectly. The eggs even look somewhat like oriole eggs! Here’s the completed bird’s nest with bird figure and eggs. While an oriole builds its nest right in the tree, this is a nest we can use for a variety of birds. I plan to change the art print and type of bird during the month. This has been a super-fun activity, and it’s great that Zoey can repeat it as often as she wishes. 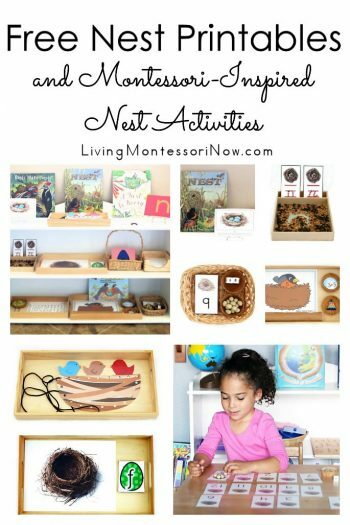 If you’d like to know more about preparing nature trays and nature tables, I have a roundup post with lots of ideas. You’ll also find our other nature trays in this post!